Holiday Express Hotel is right in middle of Kampala city with fairly a decent and affordable accommodation facility. The Hotel was recently refurbished and equipped with modern facilities. The hotel has a total of 59 fully air conditioned rooms with internet connection and 41 sound-proofed deluxe twin and double rooms making a total capacity of 159 beds in 100 rooms. The hotel is also located in a public-transport convenient location and central shopping district. With all the main shopping malls are within a walking distance. 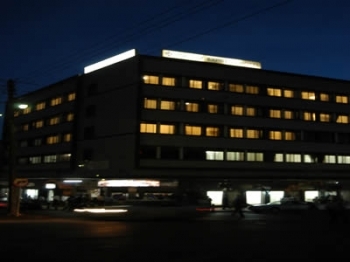 The hotel also features a recently renovated multimedia business center complete with full internet access, secretarial and fax services, private bath and shower, 21 inch color TV with satellite connection, direct dial telephones, spacious study area, reading desk fitted with a reading lamp, dressing table and mirror. All of our rooms feature great views of Kampala’s historic attractions including Namirembe and Lubaga cathedrals, The Kabaka’s Palace at Lubiri and the Kasubi Royal Tombs. The Holiday Express Hotel restaurant has a sitting capacity of 80 people and serves savory local and international delicacies. The menu ranges from the fast-food/quick-bite kind of food to full course authentic specialized cuisines.The restaurant is designed to give you a relaxing atmosphere. We invite you to enjoy our favorite local dishes; cooked tastefully by our experienced chefs and laid out in a royal fashion. The Holiday Express Hotel has 2 well stocked bars located on the first floor of the hotel building next to the main restaurant. They both offer nice views of the city action down below. It is an ideal venue to unwind and relax after a hard day. It is also an interesting place to meet colleagues or friends for a drink or a meal. The bars are well stocked with all your favorite brands of beers, liquors and wines (both international and local brands).They are open 7 days a week from 9AM to 12 Midnight except on special days. Please come and sample our outstanding service and drinks. White boards, video monitors, secretarial services, internet access and fax services.